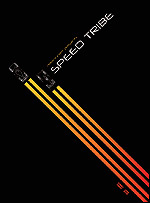 Speed Tribe is an audio/visual project from Daniel B. and Patrick Codenys of EBM pioneers Front 242. As this is a music magazine, I'm concentrating on the CD part of this release, but it also includes a DVD with digitally edited footage of the 2001 Le Mans 24-hour race with a Speed Tribe soundtrack. The CD contains a remixed version of that soundtrack and is a veritable cornucopia of instrumental electronic music styles and sounds. Kicking off with the slow, steady build of 'mechanical', the Speed Tribe sound ranges from intense noise to chill-out soundscapes. After 'mechanical', there's the throbbing EBM sound of 'A.W.A.I.T.C', then the ambient piano sound of 'vinyl', followed by the harsh electro beats of 'u'. And on it goes, twisting and turning, changing from one track to the next, different moods and different atmospheres. Yet, it all hangs together fairly well, there's no jarring contrast between the tracks, it's well mixed so that the changes are fairly smooth, so the full-on intensity of the d n' b influenced 'Kichikichi' sits well alongside the more IDM sounding 'Access' and the Twin Peaksy 'Fishing brain bytes'. While it's no substitute for the long-awaited new Front 242 album, this is an interesting and enjoyable work with an appeal far broader than just the EBM scene (though, the classic EBM scene is receiving increased attention these days). It's worth checking out if you are a fan of instrumental electronic music makers like Aphex Twin or Orbital as well. Daniel and Patrick have also been working on another project, Male or Female, but, at the end of the day, can we have the new Front 242 album soon, please.